Cookin' in the 'Cuse: Wow! I believe there are still tickets available so call the Center to reserve your spot and check out the Baltimore Woods website to learn more about this local gem if you don't already. When we travel to the Bahamas to visit my husband's family don't think we are lounging poolside at the Atlantis resort knocking back Goombay Smashes all day and night. Oh no--we stay in the small fishing villages of the Abacos where you are more likely to hear my husband and relatives say things like--"Let's go out tonight and get that big barracuda!". And they do. Next thing you know there's my sister-in-law hustling in the kitchen to pan fry it and serve it up with some peas and rice. And it's delicous. I wasn't around to see the catch deskinned and such, but what was brought to the kitchen were some beautiful, white-fleshed steaks that tasted much milder than the barracuda's menancing grin would suggest. I'm going to see if it is available locally and if it is-- I suggest that you check it out. Atlantic wild-caught barracuda doesn't really appear on the Monterey Bay Aquarium's Seafood Watch list--perhaps a good thing. Besides--won't your friends love you if you tell them that you're serving grilled barracuda instead of another slab of salmon? As we were leaving folks were going on about wild boar--can you say sausages?!? Oh I can't wait to return. With Eric Schlosser's vistit to Syracuse next Tuesday we have now played host to some of the most influential people in the world of food politics and sustainable agriculture. Speaking on investigative journalism as part of the University Lecture Series, Schlosser will be a Hendricks Chapel at 4pm on Tuesday, March 1. The event is free and open to the public. Schlosser has written about important topics other than food but his book, Fast Food Nation, put him on the literary map and literally changed my life. I remember reading Fast Food Nation in the spring of 2002 as I prepared to move to Berkeley, CA. There was an "aha moment" on nearly every page and I'm pretty sure that I was stopping people on the street to tell them about how messed up our food system had become. I remember urging all my friends to read the book immediately. And within the space of a week I overhauled my diet from top to bottom. Sure, I'd read Pollan's Botany of Desire the year before, but Schlosser is the one I credit with me learning to ask hard questions about where my food came from and what was in it. I used to go to McDonald's quite often but had given up chicken mcnuggets in the late 80s upon learning about the horrific working conditions of those who worked the line to turn birds into nuggets. Reading FFN was the death knell to what was a love affair with fast food and I've never looked back. By August of 2002 I had settled in Berkeley, subscribed to a farm share (oh River Dog Farm, how I miss you still!) and traded strange things in my Big Mac for "strange things" in my farm box--hello celery root and persimmons! Schlosser will probably speak about more than food--his topic is investigative journalism--but it is sure to be a fascinating time. I hope to live tweet the event in case you can't be there. I've been nursing a blog post for a couple of weeks now about small food. Portions, that is. With the holidays upon us I've searched for ways to keep the words, "indulgent" and "favorite foods" in my vocabulary while not adding other words like, "guilt" and "pounds". With all of that snow fall we had in Syracuse this month I've had plentiful opportunities to hunker down and bake. I've been churning out loaves of banana coconut bread, experimenting with baguettes and bread sticks, and turning the last of the apple harvest into rustic tarts...but small. I was going to wax on about the beauty and deliciousness of small bites and miniatures and post a bunch of recipes. But then a long-awaited gift came to us--a beautiful, small, baby boy we've named Timothy Aaron. He eats like a champ and while he does, I whisper sweet somethings in his ear like " Flour City pumpkin pappardelle pasta with pesto" and "mise en place". I'm hoping he can begin to get excited about these things when the time comes for solid food. Oh the fun we are going to have! I'll be rethinking much of what's on my figurative plate but I hope you'll keep checking in here from time to time. I'll write as I can--who knows what Timothy will inspire? In the meantime, peace and joy to you this holiday season and grace and good tidings for the new year. Michael Pollan with Edible Finger Lakes publisher Michael Welch, creative director Zoe Becker, and me. By his own admission he is not a nutritionist--just an Englsh major trying to eat real food. Tonght, to a nearly packed house at the Syracuse Civic Center, Pollan wove together the themes of his three most recent books: Food Rules, In Defense of Food, and The Omnivore's Dilemma into an accessible primer on the ills of our food system and what we might do about it. Even if you have read his books you'd find the reminder of some of his points startling: 20% of food is consumed in the car; the typical Western diet (filled with refined carbs, salt and sugar) is largely responsible for high rates of heart disease, type 2 diabetes, and 1/3 of the cancers diagnosed; we've largely forsaken eating for pleasure and community building for eating for health--except we're getting less healthy; Americans spend only 9% of their income on food--less than any other industrialized nation (and if I'm not mistaken, this number has gone down in the past decade). He began his lecture by filling a table with some edilble food-like substances he purchased at Tops earlier in the day. There were things I didn't know existed--I mean, frozen pancakes with sprinkles already on them?!? I don't get it--apparently, I need to investigate what else is in the conventional grocery store--just to see it. I tend to shop the perimeter of the supermarket and farmers at the CNY Regional Market get the lions share of our food dollars. For those who have been reading this blog for any length of time or following the sustainable food revolution, tonight was classic Pollan--engaging, thought-provoking, and inspirational. I left reinvigorated and excited about this harvest seaon and grateful for the folks in our community who are trying to get real, whole foods onto our plates--you know, the folks listed in the left side bar. Pollan says he isn't an evangelist but I'm hoping that he made a few more Michael Disciples tonight. Each and every person makes choices each and every day that affect our foodshed and what is stocked on grocery shelves. The power to change our food system, live with a higher degree of wellness and health, and actually enjoy the food that nourishes us is in our hands--or can be if we reach out for real food. Anyone else craving kale right now, or is it just me...? Michael Pollan kicks off the Friends of the Central Library lecture series tonight! Can't make it--no worries, I'll be tweeting the highlights as he speaks. Click to the little birdie on the right sidebar to follow me on Twitter. Bittersweet Winebar and Desserts is open, beautiful, and busy! Check out their menu to get a preview of what they're serving up. I hope to get there on Friday with photos and a first impression review stay tuned! 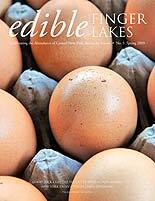 I'm working on a story for the Winter of issue of Edible Finger Lakes magazine--it's about our local coffee scene. I think I've got a crush on the Coffee Nazi at Kind Coffee--heaven help me! And the Wyllie Fox Farm Foxfest is Saturday beginning at 4pm. There's a farm tour, pumpkin carving, potluck dinner (bring a dish and a chair) and a bonfire--each activity occurs at 4, 5, 6, and 7pm respectively. For directions to the farm check out their website. I can't believe they let this man loose in the 'Cuse. I mean, how great is it that Adam Richman, of Man vs. Food, came here to take on some of the iconic eats of our area? For the Travel Channel! I must confess, I hadn't watched this program till now--I'm a member of Slow Food. So spoiler alert: Richman doesn't visit our sustainable, locavore establishments to consume mass quantities of heirloom tomatoes and pork belly two ways. He does, however, visit places that are known for throwing down some down-home delicious food. So of course, he hits up the Dinosaur, and Heids of Liverpool, and then a surprise to me, Mother's Cupboard. That last one is a surprise because I'm always complaining about the lack of really good breakfast joints around here. I mean, really good breakfast, because if I'm going to leave my routine, I want it to be good. Richman's visit culminates in his attempt to tackle the 6 pound frittata at Mother's. If any of you have had this thing, drop me a comment--it looks amazing! We're talking a pound of potatoes chunked up into home fries, broccoli, sausage, onions, pepperoni, and just a few eggs to hold it together. It is massive and though I watched the episode on a full stomach, it still made me hungry. You can check out the episode when it airs tomorrow night at 9pm on the Travel Channel. Richman is hilarious, he shows up Syracuse for the great place it is and he even taught me a few things about these food institutions that I hadn't known before. Plus you'll want to see how he fares against that enormous frittata. Man vs. Food, Travel Channel (channel 41 on Time Warner in our area) 9:00pm, September 1. Photo courtesy of the Travel Channel website. This is me, and a bike, at a winery not in the Finger Lakes. So what's cookin' in the 'Cuse? Lots--I've just been too busy preparing for a triathlon, cycling through Sonoma wine country, midwifing the inaugural edition of Edible Syracuse (you did get the latest Edible Finger Lakes magazine didn't you? ), and doing my job at church and campus to post about it. So what's the cheating about? It's about enjoying far more meals and wine in NYC and California than I have at home. And the distractions? Well, that's just called life. But here, in a few photos, are the standout moments of the past month and a half. Inpatient for the food truck craze to hit Syracuse, I keep my eyes peeled for them when I travel. If you see this ice cream truck on the streets of NYC--run toward it as fast as you can. You'll be rewarded with artisanal ice cream combinations and perfectly pulled espresso shots. While in Sonoma I got off the bike long enough to participate in a cooking class at Relish Culinary Adventures in Healdsburg. Here, Chef Victoria Blumenstein shows me a new way to fry up calamari. And yes, I was (and remain) skeptical, prefering Danny Meyer's method instead. Still, it was a fun afternoon and I learned a lot with the other dishes she prepared. This delicious, locally raised (Sonoma County) pork cheek sandwich is only half of this happy moment at Bovolo cafe. The other half is that this locavore bistro is in the back of a fabulous bookstore on the square in Healdsburg--good food AND books! Now we're talking! The meal that welcomed me home: pizza at Niles Country Gourmet near Skaneateles. Now first understand--this picture may not look like much--it was taken by my phone at night. And the pizza may look like it has a whole bunch of stuff just dumped on it. And I know I'll lose you when I say that it was a $58 pizza pie. No--that isn't a typo. But let me tell you: it was INCREDIBLE! Sandie Becker calls this the Zach pizza and with ingredients like bison lardons, pistachios, artisanal cheeses, hand made whole wheat crust, proscuitto and other charcuterie made of local, organic meats, arugula, spring onions, spinach, and on and on--I'm just sayin': You Want This Pizza. It fed three of us with leftovers--a bottle of red wine washed it down and we were happy happy. Call the restaurant ahead of time to let them know you're coming, bring a big appetite (it will help to have run a few miles before hand) and prepare to be amazed. First the Orange clinch the Big East title (we're talking basketball) and now this! Remember how I said I wanted one of these for the 'Cuse? Well thank our guy Chris Fowler and the great work he's doing with Syracuse First. Way to go Chris--and thanks! I got mine at Sparkytown. Now get yours!